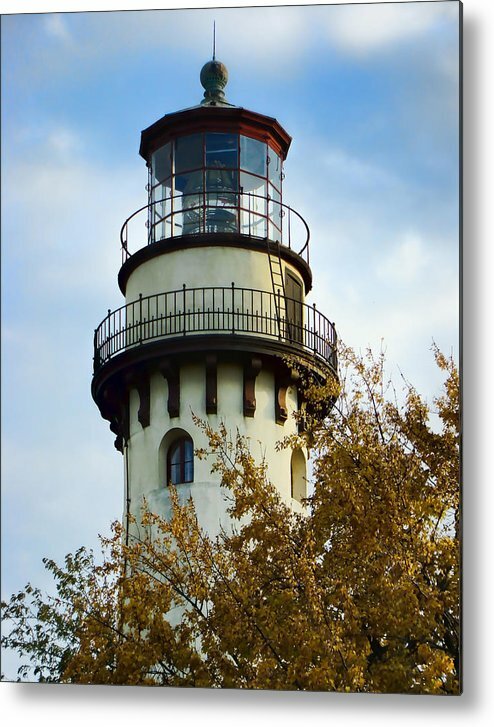 Grosse Point Lighthouse by Phyllis Taylor - 6.250" x 8.000"
Grosse Point Lighthouse metal print by Phyllis Taylor. Bring your artwork to life with the stylish lines and added depth of a metal print. Your image gets printed directly onto a sheet of 1/16" thick aluminum. The aluminum sheet is offset from the wall by a 3/4" thick wooden frame which is attached to the back. The high gloss of the aluminum sheet complements the rich colors of any image to produce stunning results. The gold leaves and the blues work so beautifully here. Beautifully composed, great colors and lighting. Love it! 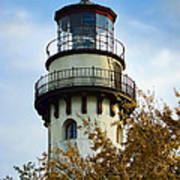 The Grosse Point Lighthouse stands on a bluff in Evanston, Illinois marking the approach to Chicago. It was build in 1873 and stands 113 feet in tower height. 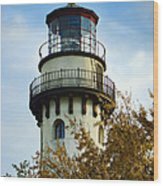 Sitting atop the tower in the lantern room was a massive second order Fresnel lens. 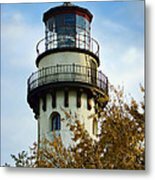 The Grosse Point Lighthouse was one of only five lighthouses on the Great Lakes to have a second order Fresnel lens. The light was visible 21 miles out into Lake Michigan.